Maiden Erlegh provides a high quality education for over 1800 students, 440 of whom are in our thriving sixth form.The school expanded to meet the growing number of applications for places at Maiden Erlegh under the Government’s “Expanding Popular and Successful Schools” programme. This additional capital investment brought many benefits to the school and created a learning environment fit for the 21st Century. We wanted to find a way of monitoring students as they were working, controlling devices and blanking screens for getting their attention. 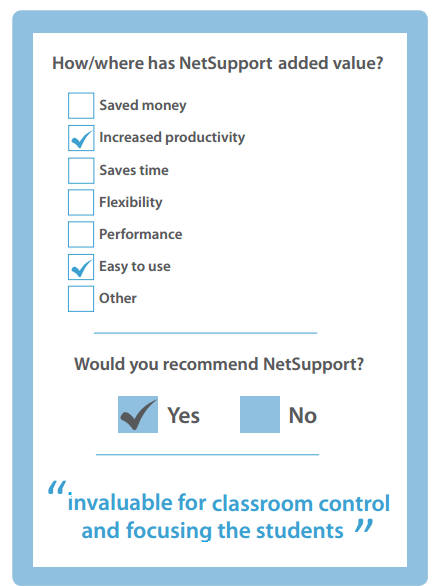 We use NetSupport School (1500+ licences) due to its range of features. It is invaluable for classroom control and focusing the students with ease – making lesson time more efficient. In ICT rooms, staff use the software to monitor student activities real time. Network technicians monitor all devices across the network for unusual activity, especially outside of main school hours. Classroom teachers monitor activity on mobile devices. Specialist staff monitor certain students throughout the day wherever they are. Students know they are being monitored, so they go off task less often!